The new Superman is giving movie bosses a headache - because of the size of his bulge. 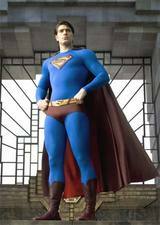 They fear Brandon Routh's profile in the superhero's skintight costume could be distracting, reports the Sun. One man's fear is my deep personal hope. Hollywood executives have ordered the makers of Superman Returns to cover it up with digital effects. The Sun's source said: "It's a major issue for the studio. Brandon is extremely well endowed and they don't want it up on the big screen. Gay groups, feel like boycotting? Boycott this. For the love of god, do you people have no principles whatsoever?! Boycott it like hell, I'm taking a pair of opera glasses. Is it my imagination, or does he look like Will Riker in tights??? OMG NO sonicfrog! He looks nothing like Will Riker in any way! He's way friggin' hotter than Frakes ever was. I swear the things people worry about. These execs should worry more about whether they made a decent movie or not. This reminds me of the whole Lohan incident. But I guess if Hollywood can go totally unreal in one direction, it can always go the other way to. The bulge in front and the bulge in back looks pretty good to me. any studio costume staff here has a video of his original costume fitting? please, please please....that's so hot. heard form an insider that he was surrounded by gay stylists while they were re-engineering his bulge. OMG, they must all ran to the hohn to beat off afterwards. Is it my imagination,I swear the things people worry about. great movie!! I Love superman!! All this mess ..for for a silly bulge. Sounds interesting, I will see the movie. I will gove to the cinema on this movie. but now a days its place is taken by spider man. hollywood has to make movie on superman rather than spider man.